1/31/2011-Beadblasted Sealed beam cans and painted, Painted H/L housings black, Began cleaning hood lock assy. 2/6/2011- Tail light housing, bumper guards, Turn signal housings to plater. 2/15/2011-(Before) Removed Upper and Lower Control Arms and Passenger side coil spring. Removed front pulley and timing cover. 2/21/2011- Finished removal of all suspension components and bumper to frame brackets, removed manifolds and carb. 2/22/2011- Removed air injection manifold, master cylinder and power brake booster. Cleaned firewall. 2/23/2011- Cleaned first set of A-frames with gasoline in preparation for the inaugural "soda blasting"
3/3/2011- Worked on PS Upper Control Arm-cleaned down to bare metal, removed inner bushings and ball joint. Picked up radiator Ordered side marker lights. 3/4/2011- Finished TS Housings and Upper PS Control Arm, Prepared and painted intake and exhaust manifolds. Used Lower Control Arm (PS) arrived. 3/12/2011- Removed bushing from DS Lower Control Arm, began de-rusting process. Removed Cast Iron connector LCA- Cleaned and de-rusted. 3/16/2011- Finished painting UCA Driver's side. Continued trying to disassemble PS Spindle. Grumble grumble. 3/17/2011- Succeeded in disassembling Spindle. Bought used manifold. This one has the egr valve and heat-shields. Cleaned, de-rusted, primed and painted spindle parts, R&R lower ball joint. 3/18/2011- Assembled PS Spindle. Installed Lower ball joints on control arms. 3/23/2011- Cleaned Junkyard Intake and Exhaust Manifolds, Heat Stove, EGR Hold down, Bellcrank, and Choke Hsg. 4/1/2011- Cleaned AIR Pump and diverter valve, removed oil pan, cleaned, primed and painted anti sway bar, cleaned and painted vacuum advance, cleaned ballast resistor, began cleaning carburetor, AM/FM radio and trunk pieces arrive. 4/4/2011- Assembled DS energy absorber, disassembled, cleaned and primed ps energy absorber. Waiting for paint. Cleaned oil pan, side covers, and rocker arm cover. 4/5/2011- Sanded, primed, and top-coated firewall. Cleaned and chased threads on LCA bolts. Painted engine block Chevrolet Orange. Removed hood hinges for cleaning and painting. 4/6/2011- Finished cleaning oil pan, side covers and rocker arm cover. Disassembled carburetor. 4/7/2011- Cleaned all carburetor parts and installed rebuild kit. Cleaned all cover bolts and ps hood hinge, primered. Replaced heater hoses on new heater valve. 4/8/2011- Primed and top-coated all engine covers. Primed DS Hood hinge and top-coated both hinges. Painted starter solenoid. Cleaned and painted original bell-crank. 4/9/2011- Re-touched alternator bracket and thermostat housings. Applied Chassis Black to DS Energy Absorber pieces. Applied clear coat to hood hinges. 4/10/2011- One more clear coat to hinges. Replaced timing cover seal. Affixed gaskets to thermostat housing, timing cover, pan, side covers and rocker arm cover. 4/11/2011-Installed springs on hood hinges. Painted all cover bolts and water pump bolts. Painted distributor Loaded car for first reassembly day in Walnut Creek. Yay! 4/13/2011- Installed power brake booster, AIR pump, master cylinder, heater hoses, power steering support. 4/20/2011- Installed Radiator support, radiator and fan shroud. Had correct brake hoses fabricated. 5/6/2011- Finished sanding DS Rear Door. 5/9/2011- Cleaned and de-rusted all battery mounting parts, primed and painted, cleaned marker light clip, sorted all bolts and screws from 70 Aerobus parts foray. Dis-assembled Aerobus front Passenger door. Cleaned switch knobs. 5/10/2011- Finished the removal of the passenger side rocker panel-lots of chisel work. Went to the Aerobus and removed the rear air conditioning unit. Will try to adapt it to the rear of the a-11. While there was ecstatic to find a relatively rust-free trunk floor. It took 5 hours of cutting to get it out but now the Checker will look a lot better.- Long long day. 5/12/2011- Finished cutting trunk spot welds, wire wheeled surface, primed and painted trunk floor. Began disassembling of rear evaporator unit from Aerobus-will adapt unit to work in A-11 rear shelf. Cleaned 4 sill plates with wire wheel. 5/17/2011- Brutal day- Last day to remove parts from Aerobus. Removed front heater assemblies, defroster ducts, underseat heater, A/C compressor, fuel tank and skid plate, tailpipe shield, front and rear bumpers, floor metal and misc. wiring. 3pm 'til darkness. Luckily only intermittent showers. 5/24/2011- Pieces of motor spread over the desk-this may be interesting. 5/25/2011- Replaced broken phenolic field junction strip in Heater Motor. Re-assembled...It works! Mounted to base-plate. Fan should arrive Friday. still sick-slow progress. 5/26/2011- Repaired Fan Grill/Painted, assembled Under-seat Heater-tested. Assembled windshield washer pump. Sorted screws, nuts and bolts. Cleaned spare tire hold-down Finished horn relay. 5/28/2011- Cleaned and painted trunk support and exhaust pipe shield. 5/30/2011- Painted under-dash evaporator and bracket. 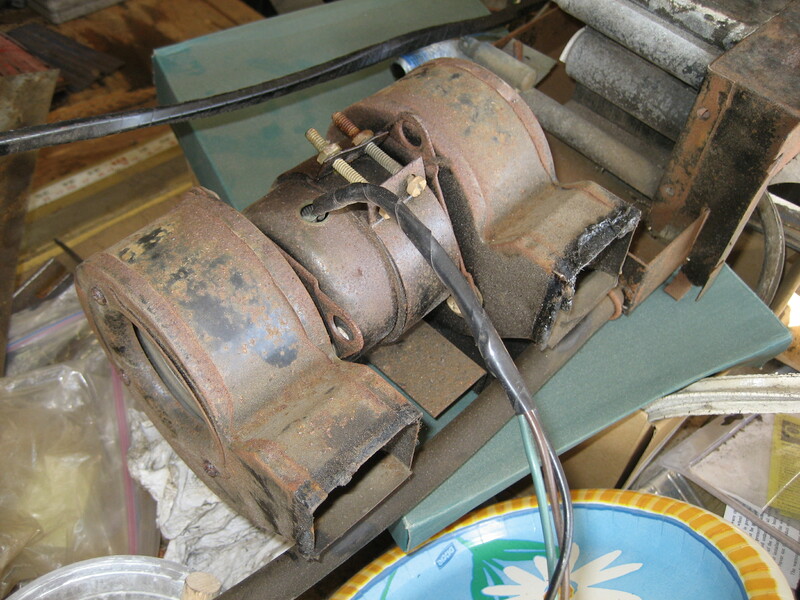 Disassembled and began de-rusting of A/C blower assembly. 5/31/2011- Last visit to Aerobus-took off fan switch, blower bracket and center link. Finished painting and motor rebiulding on A/C blower assembly. Dis-assembled and bead blasted spare heater. 6/3/2011- Back to the Aerobus- took off front brake assembly for CCOA member and spent afternoon getting it ready for shipping. Cleaned center link and idler arm. 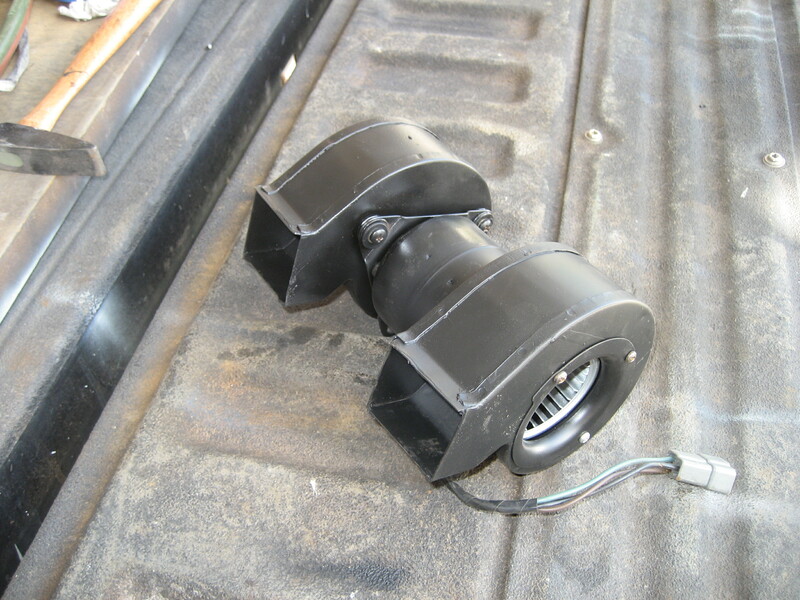 6/4/2011- Purchased bumper guards and armrests, speaker re-foam kits arrive. 6/7/2011- Continued work on Rocker Panel installation-chiseling. Cleaned PS floor in preparation for patching. Finished painting gas tank skid plate. Soda blasted spare DS front fender. Painted a-frame support. Began de-rusting spare fan shroud. 6/9/2011- Prepared spare headlight bucket assemblies for painting. Packed up drum brake parts for shipping. Sanded spare front fenders. 6/14/2011- Finally fit the new rocker panel on passenger side in preparation for brazing. Fabricated floor patch on PS front floorboard. Brazed in patch with Becky's assistance. 6/15/2011- Finished cleaning parts of headlight buckets-painted all parts, painted A/C blower parts-assembled 1 of 4 blowers. Cleaned spare license plate bracket. 6/16/2011- Cleaned and painted second blower (rear A/C), painted license plate bracket, cleaned bolts and screws from past dis-assemblies. Dis-assembled third and fourth blower. Bead blasted fans. Painted spare License Plate bracket. 6/20/2011- Made welding jigs, finished dis-assembling front fenders from Aerobus- cleaned ball joints from aerobus in preparation for shipping. 6/21/2011- Finished brazing PS Rocker Panel-ordered Rear AC vent 100 degrees in Walnut Creek-great time to weld..
6/27/2011- Finished cleaning radiator support-this was the most rusty piece so far- painted and re-assembled side shields. Spare radiator and condenser completed-cleaned and pressure checked. Painted both. 6/28/2011- Rained out in Walnut Creek. Installed radiator cradle supports and grommets. A/C bracket from Florida a no-show. Searched the web but could find none from the early 70's and A6 Compressor. Finally found a closed auction for Compressor and bracket from late 70's. $$$ but no choice. This is the last piece except for hoses to do the installation. 6/29/2011- Repaired and cleaned turn signal bases and painted. 6/30/2011- In Walnut Creek. Driver's side floor repair- Cut out rotted body mount section, cut and placed patch and brazed in place. Brazed in additional patch between body mount and gas pedal-incomplete. Installed radiator strut support grommets. 7/1/2011- Picked up re-plated Spare Parking Light Housings, Under dash A/C face plate and vent housings. Re-assembled A/C vents and louvers into faceplate. Assembled Spare Parking light assemblies. 7/2/2011- Rear AC Vent arrives from North Dakota. It's from a 57 Plymouth dash defroster-perfect match. Bead blasted and repainted. Installed in housing. 7/4/2011- Cut Door Size jigs in preparation for installation of driver's side rocker panel. 7/5/2011- Back to the Checker's house in Walnut Creek. 98 degrees and just right for brazing on the floorpan. LOL. Brazed in final pieces on driver's floor and last piece on passenger's front, Began cutting out Driver's side rocker panel. Surprised to find a panel over a panel on front section. Brazed in 3 tee nuts to replace missing caged nuts for front fenders. 7/6/2011- Walnut Creek-Continued removal of Driver's side rocker panel-rust damage more than expected. Removed fuel tank and took to shop for cleaning and coating.$$$ Yikes Sprayed undercoating on repaired floor section. 7/7/2011- Walnut Creek-Finished removing rocker panel. Fabricated repair panel for backing of rocker panel. Positioned new rocker panel in preparation for brazing. AC Compressor and brackets arrive. 7/8/2011- Finished cleaning all brackets for Air Conditioning Compressor and painted. Almost finished cleaning R4 compressor. 7/9/2011- Assembled painted A/C brackets in preparation for installation. Ordered seals and o rings for compressor rebuild. 7/11/2011- Primed and Painted A/C Compressor. Ordered bulkhead connector and compressor hose block. 7/12/2011- Walnut Creek-Long but productive day. Installed new belts. Installed Aerobus HD radiator. Installed evaporator. Installed AC Compressor and brackets. Refitted DS Rocker panel and brazed in place-complete. Ordered radiator hose and underseat hater hoses. 7/13/2011- Picked up flushed gas tank. Painted tank and fixed sending unit. Cleaned and painted mounting Bracket. 7/14/2011- Walnut Creek-Replaced AIR Hose and heater hose to accommodate AC compressor, sanded and painted fender bolt insert on firewall, cut out trunk floor. Began cleaning and rust removal from differential and springs. 7/16/2011- Have been trying to figure out what to use for a patch for the spare tire well on the trunk floor. Finally found a likely suspect- a garage sale wok-$1. Fabricated two patches from wok and brazed in place. 7/18/2011- Walnut Creek-Cleaned differential and axle assembly (partial0 and rear frame, springs and rear cross-member. Picked up re-chromed hood emblems (2).Removed tailpipe. 7/19/2011- Walnut Creek-Painted differential, rear springs, frame sections and rear cross-member. Removed rear speakers, rear window defroster, rear shelf trim, rear seats in preparation for mounting rear ac evaporator. Began fabrication of evaporator housing. 7/20/2011- Continued Shroud fabrication. Installed angle iron supports and brazed in top section. 7/21/2011- Continued Shroud fabrication. Spot brazed covering to angle iron framework. Fabricated and installed end caps. 7/22/2011- Finished Rear A/C Shroud fabrication. Installed drain stubs. Fabricated access panel. Installed condensor unit. Applied undercoating to interior and cold galvanizing compound to exterior. 7/25/2011- Had spare tire dismounted-Thanks Paul! and packed up wheel, lower a-frame and bumper for trip to southern CA. Reordered compressor hose block and bulkhead connectors. 7/26/2011- Walnut Creek- Finished cleaning and painting rear frame. Cut out more of old trunk floor. Fit in new trunk floor. No brazing after dropping Oxygen regulator-damn! Installed lower radiator hose and removed PS Impact absorber in preparation for welding. 7/28/2011- Walnut Creek-Brazed in nuts for spare tire holder. Final fitting of trunk floor. Secured floor in place with sheet metal screws in preparation for TIG welding. Weldor comes tomorrow. 7/29/2011- Walnut Creek-Had reinforcement welded on to PS Lower Control Arm. Battery support now welded to frame and trunk floor welded in place. 8/1/2011- Walnut Creek- removed all positioning screws. Seal trunk floor seams with seam sealer. Applied seam sealer to rocker panels. Began painting trunk with spatter finish-ran out of paint. Pinole-Obtained 1/4" plate (Thanks Doug) for battery holder transition piece. Started cleaning second bumper bracket and headlight trim piece. 8/2/2011- Walnut Creek- Drilled, tapped and painted battery holder transition piece, installed battery holder. Finished painting trunk interior, Began clear coat of trunk interior. Mounted spare tire bracket. Applied spatter finish to rear evaporator housing. Removed rear brake drums. Inspected brakes-all OK. Painted drum exteriors. Applied undercoating to driver's rear inner fender and underneath trunk floor. Installed PCV hose. 8/3/2011- Walnut Creek- Finished clear coat on trunk interior, undercoated PS rear inner fender. Installed fuel tank and skid plate, connected all fuel and vapor lines. 8/4/2011- Walnut Creek- Mounted rear A/C Evaporator. Cleaned all brazing points on body and primed. Pinole-Finished cleaning rear bumper brackets. Straightened mis-shaped bracket and primed. 8/5/2011- Cleaned bumper bolts, bumper adapter plates, Kick-pad bar. Painted bumper brackets, bumper adapters and bumper bolts. Cleaned spare tie rod end and adjusting sleeve. 8/6/2011- Cleaned remaining bolts, nuts and washers. Painted e-brake guard. 8/8/2011- Began de-rusting process on spare fan shroud-major rust. Refilled oxygen cylinder. 8/9/2011- Walnut Creek-Installed rear bumper brackets, rear A/C drain tubes, hose transition hardware through fender and threaded inserts for front and rear fenders (3 brazed). Cut out and fitted dash hole filler. Installed choke rod and clear coated air cleaner and power brake unit. 8/10/2011- Cut out backing metal for dashboard patch. Picked up Checker parts from auction-condensors, compressor, dash panel and gauges and jump seat. 8/11/2011- Straightened bent metal on spare radiator cradle (ebay). Welded nuts on cradle, brazed dash patch to backing. Painted cradle and dash plate. Walnut Creek- Installed adapter bracket to A/C compressor mount. Filled imperfections on dash with body filler, filled with spot putty. Painted with wrinkle finish. Brazed in final patch to driver's floor and undercoated. Undercoated inner fender patch from Tuesday. Cleaned rust from kick panel area and primed. Installed emergency brake control Cleaned dimmer switch. 8/22/2011- Walnut Creek- Install under-dash evaporator unit. Cut hose openings in firewall and floor. Repositioned gas pedal. Undercoated firewall and floor patch. Installed AC hose tees. Trimmed adapter plate bolt. Sanded dash patch and re-puttied. 8/23/2011- Walnut Creek- Re-puttied dash imperfections one last time, sanded and painted. Mounted under seat heater to floor-waiting for rubber seals. Repaired door pillar wiring harness. Removed remaining exhaust pipes. Had muffler shop fabricate new pipes. 8/25/2011- Walnut Creek-more sanding on dash patch, installed exhaust system-new header pipe,2 new extension pipes, new muffler and refurbished tailpipe. Split front inner and outer fenders. Made pattern for rear shelf cover. Made clearance opening in inner fender to clear battery holder. Removed old battery holder from inner fender. 8/26/2011- Cleaned spare tie rod ends and idler arm. Dis-assembled spare under-seat heater. 8/29/2011- Walnut Creek-Opening for battery holder wouldn't work correctly-rework. Cut out old adapter and fabricated new and improved version. Mounted inner fender on car temporarily. Measured and fabricated back seat shelf-masonite. Cleaned fender bolts and sanded and cleaned driver's side inner fender. 8/30/2011- Walnut Creek- Hung DS Inner fender, 2 front fenders, hood and rear fenders. Placed masonite shelf trim piece. Sanded Inner fender. 9/1/2011- Walnut Creek- Removed roof rack, rails, and clearance lights. Began overall sanding- roof, hood, ds fenders front and rear, ps fenders- front & rear and trunk lid. 9/5/2011- Applied label and assembled unit. 9/8/2011- Bought new primer $$$ Yikes. Spent the entire day cleaning the layers of dust, dirt and rust from the garage and putting away tools. Nice to have things back in order. Dis-assembled DS front door. 9/10/2011- Disassembled spare front fender assemblies and began sanding paint and grinding rust. 9/18/2011- Sanded and primed spare inner fenders. More bolt cleaning. 9/19/2011- Walnut Creek- more sanding on body in preparation for paint. The dust falls like snow. 9/26/2011- Sanded PS Front door- incredibly difficult to remove the Imron paint from 1982. That must've been excellent paint back then, just somewhat toxic. 9/27/2011- Walnut Creek- Grinding more old paint into powder (sanding)- rear inner fenders and trunk lid. Pinole-Finally came up with a repair strategy for Passenger Front Door. Cut out first group of repair pieces and mounted. 9/29/2011- Fabricated last piece for corner of PS Front door and brazed into place. 9/30/2011- Started Bondo work on PS Front Door. Cut out rusted areas on DS Front Door. Cut and fitted patches. 10/2/2011- Brazed in patches on DS Front Door-sanded side surfaces and primed. 10/3/2011- Debacle time- Bondo from 9/30 failed to harden. Helluva job to remove-messy messy messy. Sanded side surfaces of PS Front Door and primed. Sanded on extra rear door. 10/4/2011- Layer of bondo, sanding, layer of bondo, sanding, layer of bondo, sanding etc. on fronts of front doors and spare rear door. Getting closer. 10/18/2011- Unloaded compressor. Moved Checker from Becky's house to Isa's. Gathered all body materials. Tomorrow we begin again. 10/19/2011- Moved over doors, tools and paint supplies. Sanded more on the trunk area. Wired in compressor. 10/20/2011- More sanding 5 hours), removed body sealant from first gutter. 10/21/2011- Still making paint dust. Sanded front fenders more, filled in opera light (before, after) and CB antenna holes (before after). Filled dents in rocker panel. Sanded upper firewall below windshield. Removed trunk lid. Big push next week. 10/24/2011- Finished sanding inside of trunk lid. Removed Hood. Sanded inside surfaces. Block sanded fenders and bondo repairs-final. Primered trunk lid interior. 10/25/2011- More sanding on roof. Primered hood interior. Removed body seal from DS roof gutter. More sanding on front fender-removed, Detail sanding on DS Inner Fender. 10/26/2011- Began the day sanding the ds inner fender, and straightening all the bends. Removed the inner fender and continued the sanding. This took all morning. Sanded air intakes and primered. Sanded upper firewall and primered. Hung doors from rafters so they'll be easier to prime. Sanded remaining surfaces and flanges on PS front fender. Straightened all bends. Repeated sanding, straightening, and removal process of PS inner fender Hung both inner fenders in preparation for priming. 10/27/2011- Sanded front bumper filler and Passenger side rear door. Cleaned and sanded all door jambs. Began closing in large openings with cardboard-beginning of masking process. 10/31/2011- Sanded bondo on rear panel joints. Sanded headlight bezels and rear bumper filler (last panel)(before-finished) Masked windshield, rear quarter windows and rear window. Sanded roof. 11/1/2011- Finished masking the passenger compartment, sanded bondo on inner fender. Swept down the garage, ripped rags and primered- passenger side-firewall-roof-drivers side- doors-hood-trunk opening-trunk lid-rear fenders-inner fenders. Long long day. Luckily Mami came out from San Francisco with lunch and to assist. 11/3/2011- Installed DS Doors and Front PS Door. Installed hood hinges. Installed DS Inner Fender and PS Inner Fender. Installed and aligned trunk lid. Applied more spot putty to trunk lid. Sanded primer on 3 doors. Rain today-no priming. Front view. 11/4/2011- Priming Day 2. Final Sand on Hood. Mounted hood with John's help. Thank God for good friends, Cleaned surfaces of front fenders, PS Rear door, roof and hood-Thank you Mami. Applied primer to fenders, hood, rear door. 11/8/2011- Went back over the body surfaces. Sanded paint with 400 wetordry to remove dust specks, orange-peel and any paint imperfections- all ready for final coat but must wait another 48 hours for first coats to cure. 11/9/2011- Quick trip to Walnut Creek this morning. Cleaned overspray from dash and steering wheel. Good thing as the paint is hardening. Just in time. 11/13/2011- Sanded problem areas DS Rear Door and headlight bezels with 2000 grit wet or dry. 11/14/2011- Recoated problem areas with last remaining paint. 11/15/2011- Stripped all masking from car. Re-assembly begins. Installed rear fender welt, trunk lock and handmade body gaskets. Mounted tail-lights, back-up lights and License Plate light Re-installed rear bumper surround. Cut out 6 rubber gaskets for front bumper surround. Made replacement straps for tail-lights. 11/17/2011- Found I had purchased "new style fender welt" in 1990. Took off yesterday's fender and installed both front fenders with the new welt. That was a breeze compared to yesterday. It also enabled me to drill the missing two holes on the DS fender. Installed horns on inner fender. Installed new license plate light bezel on bumper. Installed front side marker lights. Install grille and parking lights. Made pattern for Headlight gaskets and cut out rubber ones from stock. Placed Headlight buckets in fenders. 11/29/2011- Hiatus for health concerns- Began assembly of doors (DSR). Installed roof rack strips. Cut out rubber gaskets for door handles and clearance lights. Repaired broken mounting stud on clearance light Installed wiper pivots and washer nozzles. 12/1/2011- Continued Assembling doors DSR, DSF and PSR complete. Mounted remaining clearance light. Installed hood insulator. 12/8/2011- Continued work on PS Front window assembly. Rust problem as well as movement. Will need to locate lower window channel. Aligned doors. Cleaned more overspray from dash and steering wheel. Finished installing PS Headlight bezel. Installed front fender molding-passenger & drivers side. Installed hood medallion. 12/15/2011- Towed Checker back to Becky's garage. Thank God for John's help as it was a bear to back in. Loaded the last of parts and supplies and scrubbed down Isa's garage floor. Using his garage for painting was a lifesaver. 12/20/2011- Installed front bumper, bumper guards, license plate bracket and fog lights. Adjusted PS rear door. New sign Thanks Joe! 2/20/2012- After a two month hiatus, a little progress. Installed new PS Front window and all finally works as it should. 2/21/2012- Installed horn relay. Cleaned overspray. Began re-wiring. 2/22/2012- Continued re-wiring in engine compartment. Installed gas filler and headrests. 2/23/2012- More wiring, horn relay, fog lights. Installed radio panel and AM FM radio. 3/3/2012- Patched tear in fiberboard headliner. recolored. 4/1/2013- Ordered spare parts from Kalmazoo-Todd Harroun- fenders, hood, floor sections, door pillars door, door skins, rear panel, instruments, glass, springs,. 635 lbs. Wow!! 7/8/2013- 4 am- hooked up Checker behind Tundra and towed to Pinole-success. Pushed into garage. 7/10/2013- Removed drip-rail caulk, Removed two dents-rear fender, Cleaned and painted trunk interior. 7/11/2013- Cut floor and began moving the rocker panel outward. 7/15/2013- Prep work on rocker panel. Pulled back into shape and tacked. Began cleaning cross-member and repainted starter. Attempted to get exhaust system installed but pipes need to be re-bent. 7/17/2013- Primed door. Installed locks and window mechanisms and window frame. Drilled door for molding. 8/3/2013- Waiting for spring bushings and engine bearings. Sent clearance lights out to be re-plated. 8/4/ to 8/26/2013- Removed DS Rear Spring, Cleaned, de-rusted and painted-re-installed. Removed rocker arms and all drive train covers. Replaced valve lifters. Replaced push-rods. Installed main bearings and rear main bearing seal. Problem: In replacing #1 rod bearing snapped 1 connecting rod bolt- Ordered complete set. 8/28/ to 9/5/2013- Replaced rocker arms, replaced rod bearings, replaced connecting rod bolts. Cleaned transmission linkage, cleaned center link and cross-member. Cleaned motor mount bolts. 9/7- 9/10/2013- Installed New Oil Pump, Cleaned and painted shift selector bracket. Cleaned more bolts on cross-member. Ordered leaf spring bushings (Raybestoes 576-3404). Ordered motor mounts. 9/11- 9/15/2013- Broken rod bolt-Installed all new rod bolts, installed oil pan, installed lower bell housing cover, replace brush holders and springs on starter, replaced field coil insulator, installed starter, replaced rear transmission cross-member and mount, cleaned motor mounts and reconnected steering linkage, cleaned and painted accelerator linkage-installed. Re-assembled clearance lights-rechromed housings, new lenses and bulbs. Continue cleaning bolts in engine section. 9/16- 9/22/2013- Installed starter cover on bell housing, disassembled starter-replaced brush holders and field coil insulator, installed starter. Cleaned motor mounts and mounting frames-painted. Cleaned, painted and installed throttle bell crank and linkage. Removed old gas pedal and installed OEM used pedal assembly. Removed e-brake cross member, cleaned, straightened and painted-reinstalled. Cleaned frame in vicinity of cross member. Removed and installed oem front e-brake cable. Removed rear DS e-brake cable. 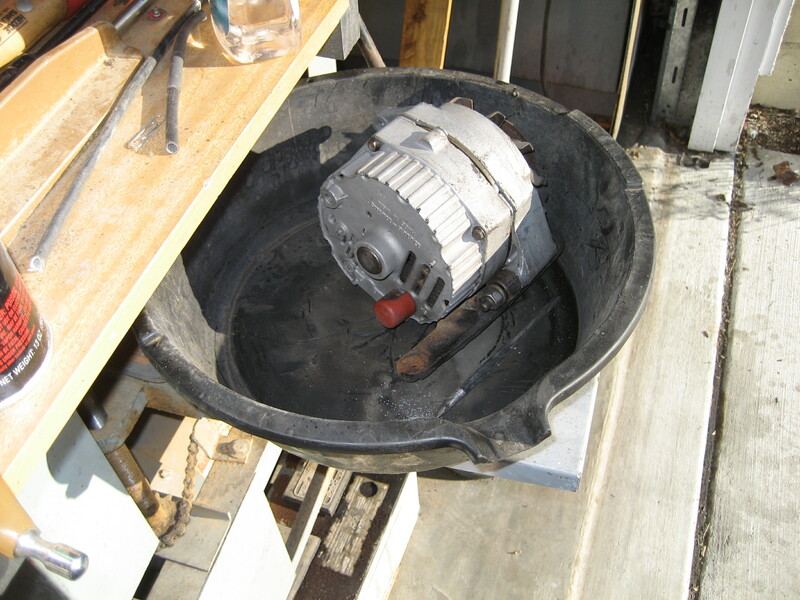 Disassembled DS rear drum brake assembly. Cleaned parts and backing plate-repainted. Removed defective wheel cylinder-leaks- and installed new unit. 9/23- 9/30/2013- Reassembled DS rear brake with new springs and hold-downs, removed and replaced rear brake hose. Removed and replaced DS Rear Leaf Spring bushings. Removed and replaced DS Rear shock absorber.,Disassembled PS Rear Brake-cleaned and painted backing plate and cast hardware. Replaced wheel cylinder, replaced all springs and self adjusting assemblies. Removed and replaced PS Rear Shackle bushings. Removed PSR Shock absorber and replaced with gas filled KYB unit. 10/1- 10/7/2013- Disassembled E-Brake linkage-under-car-cleaned and painted-reassembled (cont) and adjusted. Began cleaning frame in preparation for painting. Replaced body bolts. Touched up differential. 11/11- 11/18/2013- Continued work on frame. Began replacing body mount cushions and bolts. Ordered Stainless Fuel Tank, barrier hose, and stainless exhaust pipes and clamps. 12/03- 12/17/2013- More Scraping and metal prep underneath. Purchased spotlights- Cleaned and polished. Searching for missing pieces. instructions template New correct stainless steel gas tank arrives. 12/18- 1/10/2014- Cleaning Underbody and backing plates-rear brakes. Underseat heater switch arrives. 2/1- 2/14/2014- Finished cleaning backing plates-rust encapsulated. Continued final cleaning on frame-rust encapsulated, finally finished taking off undercoating and rust from lower firewall and center transmission hump. Located oem exhaust hanger brackets. Began applying white rust encapsulator to underbody. Removed door (ds) for new door skin. Began floor repair at dimmer switch-daunting. Touching up-frame Made floor patch at dimmer switch and installed. 2/14- 2/28/2014- Made center hump patch and installed. Reading parts book, realized under-seat heater was on the wrong(DS) side. Patched holes-will mount heater on PS. Cut out floor section on Passenger's side front. Adapted Studebaker Lark floor pan, fitted in place, added body mount and began brazing in place. Finished brazing PS Floor, installed body mount plate on Driver's Side. Closed remaining holes on DS Front. Final 7 floor patches...whew glad it's over 1 2-3 4 5 6-7. More touch up underneath-finally painted the white. Yay! 9/5/2014 - Transmission in final re-assembly. Hope it arrives home this weekend. 10/12/2014 - Transmission returns at long last-almost 10 months to the day. 10/13/2014 - Got the transmission on the jack. No small feat. My aching back. 10/19/2014 - Installed transmission, starter, crossmembers. 10/22-10/23/2014 - Primed and painted driveshaft, replaced front u-joint. Installed driveshaft. Early 2015 - Still getting parts for interior, sheet metal, frame and charging system. Rebuilt 2 original Motorola Alternators and began organizing. Mami has brain cancer so work is suspended. 9/4/2015 - Straightened A-pillar, realigned b pillar. 9/14/2015 - 9/19/2015 - Re-aligned rear lower trunk panel, sanded and filled trunk lid, rear fenders, rear doors and surrounding areas. Sanded PS fender and rear door. 2/29-3/2/2016 - Bending and forming stainless fuel line. Struggle to flare, gave up and used compression fittings. Reinstalled on frame in preparation for stainless fuel tank install. 0229a 0229b Installed new hazard light knob. Headliner ordered, new carpet set arrives (black). 4/5/2016 - Dropped off old A-11 door panels, 4 new panel sheet metal, 4 new backing boards and 4 new Aerobus door panels (fr & rear pic) at the upholsterer. He will combine all the pieces so we have new inside door panels. Should take 2 weeks. 4/6/2016 - Continue block sanding roof. 5/23/2016 - 320 sand in engine compartment. 08/07/16 - Installed weather strip and top trim to PS Rear Fender. Realigned doors. 10/10/16 - Dropped off rear cushions at upholstery shop in El Sobrante. 1/31/17 - Cleaned Garage and put away spare parts. 2/12/17 - Installed and wired new kick-down switch. Connected starter wires. Bled master cylinder. 2/21/17 - Installed new speedometer cable. Continued connecting wiring. 2/24/17 - Begin re-route of vacuum lime to kick-down modulator. 3/2/17 - Wiring connections in engine bay. 3/6/17 - Begin work to gain battery clearance-inner fender. 3/15/17 - Battery hold down construction and final hose hookups. Auxiliary cooling fan wiring begins. 3/23/17 - Wired in radio, Connected oil pressure gauge. 3/27/17 - Connected fog light switch, radio power and antenna, auxiliary heater switch. Routed and insulated under-hood wiring (partial). 3/31/17 - Mounted fog light relay. Connected fog light switch wiring. Mounted voltmeter. 4/4/17 - Wired in voltmeter. Begin wire ID under dash.